The new facility will create 100 full-time jobs. 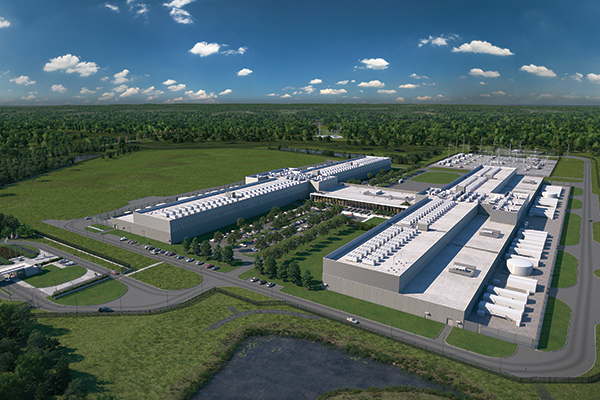 Networking giant Facebook plans to create a 970,000-square-foot Henrico County data center powered by solar energy. The project represents a total investment of $1 billion. That figure includes the $750 million cost of the data center and $250 million in Dominion Energy solar facilities paid for through a special tariff charged to California-based Facebook and other large energy customers. When completed, the data center will have 100 full-time employees. McAuliffe stressed that providing Facebook with a renewable energy supply was crucial in landing the deal. The governor told Virginia Business in 2015 that increasing Virginia’s renewable energy capacity would be crucial to the commonwealth’s efforts to gain new investment from major technology companies. “They make it clear that they will not put any more facilities in any state that will not/cannot deliver renewable energy to that facility,” he said. The governor’s office said Dominion Energy and Facebook designed the renewable energy tariff, called Schedule RF. The State Corporation Commission must approve the tariff before it goes into effect. Helping to make Henrico more attractive to new data centers is an April decision by the county’s board of supervisors to lower the tax rate on data center equipment from $3.50 per $100 of assessed value to 40 cents per $100. In addition to the full-time jobs created by the data center, the Facebook project is expected to generate hundreds of jobs during construction. A recent study by the U.S. Chamber of Commerce estimates that construction of a data center of this size will employ up to 1,688 local workers, provide up to $77.7 million in wages for those workers, and produce $243.5 million in output along the local economy’s supply chain during construction. The same study also estimates an annual injection of $32.5 million into the economy once construction is completed.